IMG Consulting, who manage Robinson’s partnership with the Wimbledon Championships, will work with KRU Live to bring the queue for the Championships to life this summer. 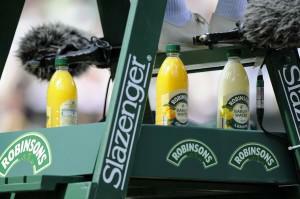 As the Official Still Soft Drink of Wimbledon, Robinsons is part of the make-up of the championships. For almost 80 years this uniquely British brand has enjoyed pride of place on the Umpires Chair, Centre Court. There is a synergy in the association between Wimbledon and Robinsons, where their famous Barley Water was created in 1935. Quite simply, Robinsons is Wimbledon. The Wimbledon Championships is the oldest tennis tournament in the world, and widely considered to be the biggest and the most prestigious. It has been held at the All England Club in Wimbledon, London since 1877. It is one of the four Grand Slam tennis tournaments, the other three majors being the Australian Open, French Open and US Open. Wimbledon is the only Major still played on grass, the game’s original surface, which gave the game its original name of “lawn tennis”. Wimbledon is not just the most prestigious Tennis tournament on earth; it typically also marks the beginning of Summer. Summer is all about fun, sun, sports and games, so this Summer, Robinsons is inviting everyone at Wimbledon to come and PLAY. The ‘PLAY It’s Thirsty Work’ campaign works on the premise that the happiest family moments are when parents play energetically with their kids – simple running around, rough and tumble, tickle- till-it-hurts, proper out-of-breath play -because they’re completely engrossed and caught up in the moment. Robinsons are encouraging parents to get their kids to put away the iPads and get outside, play and have fun. This year Robinsons will create an experiential area alongside the queue: a large grassy open area where tennis goers can enjoy a cold Robinson’s drink and have some fun while they await entry to the grounds of SW19. Tom Eatenton, MD at Kru Live says: “We are very pleased to be working with IMG Consulting and this exciting event. You won’t find many longer standing brand/event associations and the high level of staffing and delivery that is required for this activity is exactly what Kru Live are known for. We have had an overwhelming response from outgoing and exciting individuals that are desperate to work on it. ‘Play’ in the sun at Wimbledon – it’s perfect!”.